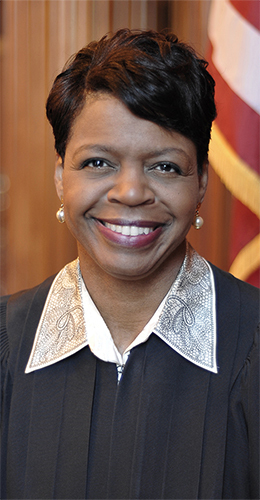 The Honorable Cheri Beasley, Chief Justice of the North Carolina Supreme Court, will address the nearly 900 graduates during Fayetteville State University’s (FSU) 152nd Spring Commencement on Saturday, May 11, 2019, at 9 a.m., at the Crown Coliseum. The event will be webcast live beginning at 8:30 a.m., the start time of the processional. To view commencement via webcast, go to: http://live.crowncomplexnc.com/. Graduate School Commencement will be held Friday, May 10, at 10 a.m., in the Felton J. Capel Arena on the FSU campus. Fayetteville Mayor Mitch Colvin will address the nearly 150 graduates. The public is invited to both exercises. Presiding over both commencements will be FSU Chancellor James A. Anderson. Anderson is the 11thchief executive officer. Justice Beasley has served on the North Carolina Supreme Court since 2012, having been appointed to that position by Governor Beverly Perdue and subsequently winning statewide election to the office in 2014. She was previously an associate judge on the North Carolina Court of Appeals. When she won election to the Court of Appeals in 2008, she became the first African-American woman in state history to win a statewide election without having first been appointed to the position. Prior to serving on the Court of Appeals, Chief Justice Beasley was a district court judge in the Twelfth Judicial District, Cumberland County, having been appointed to that position by Governor Jim Hunt in 1999. She is the only Chief Justice in North Carolina's history to have experience as a district court judge. Committed to supporting the legal profession, Justice Beasley serves in numerous bar organizations and a host of other professional and civic organizations. She is a frequent mentor to young adults and enjoys volunteering her time to read with elementary school students in area schools. Beasley is a graduate of Douglass College at Rutgers University, received her J.D. from the University of Tennessee College of Law, and her Master of Laws (L.L.M.) in judicial studies from Duke University School of Law. Mayor Colvin is a native of Fayetteville with a passion for helping to improve the city. 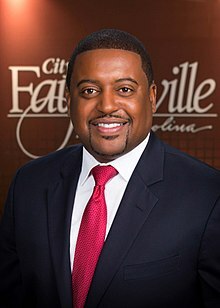 An FSU alumnus, he was elected Mayor in November 2017. Prior to that, he served two consecutive terms on City Council as a Council Member for District 3 from 2013-15 and from 2015-17. In 1995, at the age of 21, Mayor Colvin assumed the operational leadership of Colvin Funeral Home, Inc. He still leads the operation of Colvin Funeral Home, Inc.
Mayor Colvin's vision is to help Fayetteville prepare for the future by building a viable work force, investing in infrastructure and expanding our City's connection to the global economy. He is placing a strong emphasis on economic development; education and training; and the creation of a safe and secure community. Fayetteville State University is a constituent institution of The University of North Carolina and the second-oldest public institution of higher education in the state, having been founded in 1867. FSU offers degrees at the baccalaureate, master's, and doctoral levels. With more than 6,300 students, Fayetteville State University is among the most diverse institutions in the nation.